Evans (toe) was placed on injured reserve Tuesday, Scott Smith of Buccaneers.com reports. Analysis: Evans has dealt with a nagging toe injury since Week 10 and will ultimately miss the Buccaneers' final four games of the season as a result. Expect Andrew Adams to fill in at strong safety next to Jordan Whitehead during Evans' continued absence. Evans (toe) has been ruled out for Sunday's game against the Ravens, Rick Stroud of the Tampa Bay Times reports. Analysis: Evans didn't practice for the second straight week and will miss his fourth game due to the toe injury. Andrew Adams could be asked to start at strong safety again if Isaiah Johnson is unable to clear the concussion protocol by Sunday. Evans (toe) is ruled out for Sunday's game against the Saints, Greg Auman of The Athletic reports. Analysis: Evans was unable to practice in any capacity this week. The second-year safety will remain sidelined Week 14 as he continues to manage a lingering toe injury. With Isaiah Johnson (concussion) also ruled out, Andrew Adams could draw the start at strong safety. Evans (toe) did not participate in Wednesday's practice and is once again wearing his walking boot, Jenna Laine of ESPN.com reports. 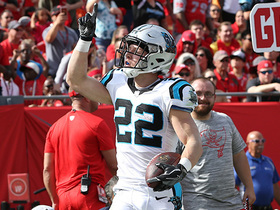 Analysis: The second-year safety couldn't make it through the Week 13 win over the Panthers due to his injury, and his chances of suiting up in Week 14 against the Saints appear dim at the moment. The subsequent pair of forthcoming practice reports over the remainder of the week should shed further clarity on Evans' status. Evans (toe) is ruled out to return to Sunday's game against the Panthers due to a toe injury, Scott Smith of the Buccaneers' official site reports. Analysis: Evans sat out the Buccaneers' last two contests due to a toe issue, and now appears to have aggravated the injury. The second-year safety will sit out the remainder of Sunday's tilt against the Panthers, allowing Isaiah Johnson to slot into the starting lineup. Evans (toe) is active for Sunday's Week 13 tilt against the Panthers. Analysis: The second-year pro worked back up to full participation in practice Friday and will resume his starting strong safety duties. His return will send rookie Isaiah Johnson, who collected 16 tackles in Evans' stead over the last pair of contests, back into a rotational role in the secondary. Evans (toe) is officially listed as questionable for Sunday's game against the Panthers, Carmen Vitali of the Buccaneers' official site reports. Analysis: Evans was a full participant in Friday's practice after having been limited Wednesday and Thursday, and the second-year pro appears to have a legitimate shot of suiting up against the Panthers on Sunday. If Evans were unable to go Week 13, Isaiah Johnson would benefit from an uptick in defensive snaps. Evans (toe) was a limited participant in Thursday's practice, Greg Auman of The Athletic reports. Analysis: Evans was also limited in Wednesday's practice. The second-year safety has missed two straight games due to a lingering toe injury and is trending towards a questionable tag for Sunday's tilt against the Panthers. The extent of Evans' participation in Friday's practice should shed some light on his chances of suiting up Week 13. Evans (toe) is ruled out for Sunday's game against the 49ers, Greg Auman of The Athletic reports. Analysis: Evans was unable to participate in practice all week and will miss his second consecutive game as he nurses a toe injury. As long as the second-year safety remains sidelined, Isaiah Johnson will benefit from an uptick in defensive snaps. Evans (toe) did not participate at Wednesday's practice, Jenna Laine of ESPN.com reports. Analysis: Evans continues to deal with the toe injury sustained Week 10 and was wearing a protective boot on his right foot as recently as Monday. The 23-year-old's participation at practice the rest of the week should clarify his status for Sunday's game. Evans (toe) still has a boot on his right foot Monday, Greg Auman of The Athletic reports. Analysis: Evans continues to nurse a toe injury sustained during a Week 10 loss to the Redskins. The second-year pro's availability for the Week 12 tilt against the 49ers is currently uncertain, but his participation in practice this week should help clarify the situation. If Evans is unable to suit up, Isaiah Johnson will once again slot into the starting lineup. 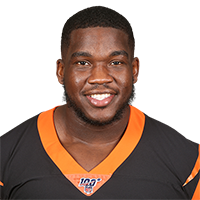 Evans (toe) is ruled out for Sunday's game against the Giants, Greg Auman of The Athletic reports. Analysis: Evans' lack of availability isn't surprising, given that he was unable to practice in any capacity this week. The starting strong safety will remain sidelined as he attempts to get healthy from a toe injury. As long as the second-year pro is unable to suit up, expect Isaiah Johnson to see an uptick in defensive snaps. Evans (toe) did not practice Wednesday, Greg Auman of The Athletic reports. Analysis: Evans appears to have suffered a toe injury during Sunday's loss to the Redskins, and his Week 11 availability is difficult to discern. If the second-year safety is unable to suit up against the Giants this Sunday, expect Isaiah Johnson to receive an increased defensive workload. Evans posted nine tackles (four solo), including a half-tackle for loss, in the Buccaneers' 16-3 loss to the Redskins on Sunday. Analysis: The starting strong safety has raised his IDP profile significantly over the last four games in particular, racking up 32 stops (20 solo) during that stretch. The impact plays and turnovers are still generally lacking for Evans, who's only got a pair of tackles for loss and has forced just one turnover (an interception) over nine contests. However, based on the sheer amount of completions alone the Bucs give up, the tackle opportunities should continue to be plentiful. Evans posted eight tackles (six solo) in the Buccaneers' 37-34 loss to the Bengals on Sunday. Analysis: The second-year safety continues to pile up appealing IDP numbers, as he's now posted back-to-back eight-tackle efforts. Evans' run-stopping responsibilities as the starting strong safety should only bump up in the absence of Kwon Alexander (knee-ACL), which in turn will boost his overall IDP value. Evans recorded eight tackles (five solo) in the Buccaneers' Week 7 overtime win over the Browns. Analysis: The starting strong safety was part of what was arguably the secondary's best effort of the season. Evans and his defensive backfield mates helped limit Cleveland quarterback Baker Mayfield to 215 yards passing, with an aggressive pass rush netting five sacks to support the cause. Given his position on the defense, Evans should continue to serve as a solid IDP option. He's now compiled 33 stops (26 solo) on the campaign. 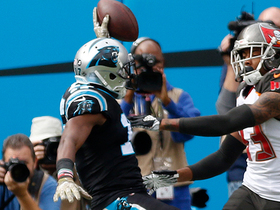 Evans posted four solo tackles, including one for loss, in the Buccaneers' 34-29 loss to the Falcons on Sunday. Evans recorded six tackles (five solo), an interception and a pass defensed across 66 defensive snaps in Monday's loss to the Steelers. Analysis: Evans made a tremendous leaping interception early in the first quarter of Monday's loss, his first of the season. He also played in every defensive snap of the game, one of only two defensive backs to do so. He'll now switch his focus to Mitch Trubisky and the Bears' passing attack, whom he'll face Sunday. Evans posted five tackles (four solo) and scored a touchdown off a fumble recovery during the Buccaneers' 48-40 win over the Saints in Week 1. Analysis: The second-year safety alertly scooped up a Mike Gillislee fumble late in the second quarter and returned it 34 yards for a touchdown, giving the Bucs a 31-17 lead at the time. The athletic Evans should see a significant bump in his IDP stock this season as the starting strong safety, as he brings an impressive all-around skill set to the position. Evans (foot) participated in Wednesday's practice, Jenna Laine of ESPN.com reports. Analysis: Evans was sidelined for over a week this preseason due to a foot injury, but appears to have recovered in time for the Buccaneers' season-opener against the Saints this Sunday. If Evans is healthy enough to suit up Week 1, he projects to serve as Tampa's starting safety. Evans (foot) isn't expected to play in Friday's game against Detroit, Dave Birkett of the Detroit Free Press reports. Analysis: Evans hasn't practiced since being carted off during Tuesday's practice session, making his absence unsurprising. Keith Tandy will figure to see some extra reps in Friday's game as Evans remains sidelined. Evans was held out of Wednesday's practice with a foot injury, Scott Smith of the Buccaneers' official site reports. Analysis: Evans was carted off the practice field during Tuesday's session. The Bucs remain confident that Evans' foot issue won't linger into the regular season. If it happens to, Keith Tandy figures to slide into the starting strong safety spot. With a rather deep secondary, Tampa Bay likely won't rush Evans back before he's 100 percent. Evans, who was credited with two solo tackles and pass breakup in Thursday's 26-24 preseason win over the Dolphins on Thursday, saw time as a slot corner in Saturday's practice, Carmen Vitali of the team's official site reports. The Buccaneers placed Evans (ankle) on injured reserve Wednesday. Analysis: The rookie was one of five players the Buccaneers officially shut down for the season Wednesday after he injured his ankle in Monday's 24-21 loss to the Falcons. Fellow safety Isaiah Johnson was added to the 53-man roster in a corresponding move, but it's expected that holdover Chris Conte will assume Evans' starting role. Evans concludes the 2017 campaign with 66 tackles and three interceptions across 14 contests. Evans (ankle) could be placed on injured reserve later this week, Rick Stroud of the Tampa Bay Times reports. Analysis: One of several Buccaneers players to exit Monday's 24-21 loss to the Falcons due to injury, Evans looks like he could be dealing with more than a minor ankle issue. With the Buccaneers out of playoff contention, there's little for the team to gain by running its starting safety out for the final two contests of the season at less than full health. If Evans is in fact shut down, Chris Conte and Keith Tandy could pick up more snaps in the secondary. The Buccaneers have officially ruled Evans (ankle) out for the remainder of Monday's game against the Falcons, Scott Smith of the Buccaneers' official site reports. Analysis: Evans left the game in the second quarter, and has been replaced at strong safety by Chris Conte. Expect an update on his status once the team provides more clarity on the situation. Evans is questionable to return to Monday's game against the Falcons after suffering an ankle injury, Greg Auman of the Tampa Bay Times reports. Analysis: Evans suffered exited the contest during the second quarter. The extent of his injury is not known at this time. Chris Conte will presumably fill in at strong safety while Evans is sidelined. Evans recorded six tackles (four solo) and an interception in Sunday's loss to the Packers. Analysis: Evans intercepted a Brett Hundley pass intended for Jordy Nelson on Sunday in Green Bay. It was the team's only takeaway of the day. Evans now has three interceptions on the year, which ties him for the lead among rookies. Evans posted eight tackles (seven solo) -- including one for loss -- in Sunday's 34-20 loss to the Falcons. Analysis: Evans now has between six and eight stops in three of his last four games, but his solid tackle total Sunday was marred by the fact that he was victimized on Julio Jones' 51-yard touchdown reception in the second quarter. The rookie safety has generally been a bright spot, however, with his Week 12 tally bringing his total to 52 tackles on the campaign. He's also snagged a pair of interceptions and defensed five passes overall, making him a viable defensive back option in IDP formats. Evans managed four solo tackles and an interception in Sunday's 30-20 win over the Dolphins. Analysis: The rookie safety continues to show up well on the stat sheet, with Sunday's first-quarter interception of a pass intended for DeVante Parker serving as his second of the season. Evans has been impressive the more playing time he's received, and he now boasts 44 tackles (34 solo), two picks and a total of five passes defensed over his first 10 career games. Evans compiled seven tackles (six solo) in Sunday's 15-10 win over the Jets. 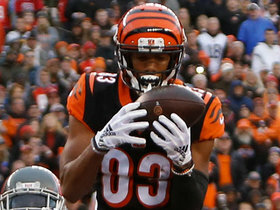 Analysis: The rookie safety was in on all 69 snaps Sunday and has posted at least six stops in five of his last six games. Evans has supplanted Keith Tandy for the starting free safety job, and his sure tackling renders him a viable IDP option despite the fact he's only forced one turnover -- an interception -- through his first nine NFL contests. Carolina Panthers running back Christian McCaffrey nearly finds the end zone and rushes for a 53-yard gain. 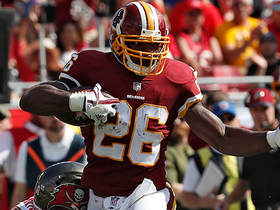 Washington Redskins running back Adrian Peterson rushes for an 18-yard gain. 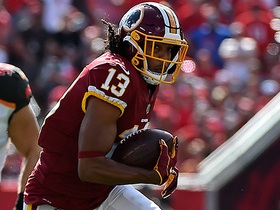 Washington Redskins quarterback Alex Smith finds wide receiver Maurice Harris for a 20-yard gain. 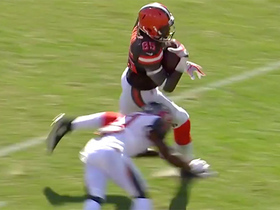 Cleveland Browns tight end David Njoku trucks defender en route to 23-yard grab. 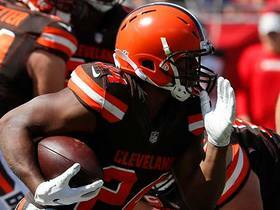 Cleveland Browns rookie running back Nick Chubb weaves his way to first down and more. 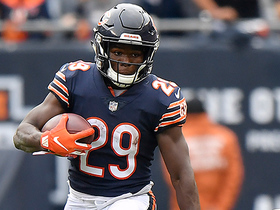 Chicago Bears running back Tarik Cohen waits for a hole to develop and bursts through it for 19 yards. 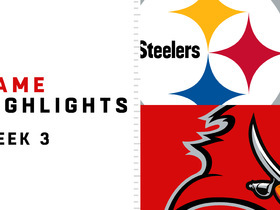 Watch the highlights from the Week 3 matchup between the Pittsburgh Steelers versus the Tampa Bay Buccaneers. 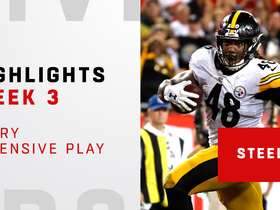 The Pittsburgh Steelers secured their first win of the 2018 season against the Tampa Bay Buccaneers - watch highlights of their Steel Curtain defense who helped them secure their win for Week 3.